Determining whether to build your fleet of construction projects with marble or travertine stone can be a bit of a dilemma. Even if you prefer to stock them both, it’s still beneficial to understand the difference between the two natural stones because one type might work better in one space more than the other. Another reason why you’d want to be educated about the two tiles is so that you can sell it to your clients and/or customers. Whether you are a building contractor or selling natural marble tile in retail, it always helps to be knowledgeable about the product you’re selling, because this is how you establish trust. When you know what you’re talking about, not only your product, but also your brand becomes a trusted source of reliability. Keep in mind that marble and travertine is a type of stone, so it’s heavy and anything that has a significant amount of weight is going to take a significant amount of manpower to extract it. The process that it takes to get this product to you cost. So, the price per square foot is going make up for that expense, also increase so that a profit is made. So now you know what makes them similar from a business perspective. Now, lets get into the details of each natural tile. 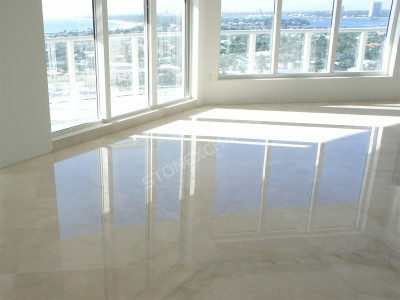 Marble tiles screams luxury, beauty, durability and class. So naturally, everyone wants it, and rightfully so! It’s beautiful and has already proven to stand the test of time. Marble is known for it’s lustrous shine that gives off enough reflection of light to brighten any space. Marble is particularly popular in warmer climates because of its cool surface. However, builders contracting in warmer climates are finding smart ways to incorporate this tile into their projects by installing under floor heating to warm up the marble tiles during the colder seasons. While marble has a shiny surface, there are other types of finishings that you can get customized. For instance, you can get honed for to achieve a matte surface, or textured for a rougher finish to complement a rustic theme. The important feature to know about marble is that it’s waterproof, yet slightly porous. This may seem more like an oxymoron, but what you need to understand is that if you get marble wet, the water will bead up and roll right off the surface. However, should you spill a red wine onto the surface, it’s porous enough to seep through if you don’t wipe it up right away, leaving a stain. So if you want marble countertops, it’s highly recommended to treat it with an annual sealant that’s affordable and easy to apply. View Nalboor Tiles online selection of marble tiles and wholesale prices here. This type of natural tile stone is just as durable as marble, although the way it’s formed is totally different. While marble stone is formed beneath the earth, travertine is created above ground near caves and hot springs. Much like stalactites in caves are formed, so it is with travertine stone, except instead of cones perturbing from the ground and hanging from the ceiling, it’s formed in flat beds. Here, you’ll find that because of the way it accumulates, travertine is much more porous than marble. As a result, you’ll definitely need a sealant for this kind of tile. This porosity results in a natural texture that’s much more obvious to the touch. Travertine is the type of stone that most builders prefer to use for wet areas, especially for public places to prevent any slip and falls. Travertine’s textured finish offers a feature that natural marble doesn’t and that’s traction. The textured surface grips just enough to keep you safe. Unlike marble, travertine comes in one neutral tone with color shades in variations of beige, cream, grey, and ivory. This is considered the mid-grade of the travertine family starting at $2.95 ranging up to $4.39 per square foot depending on the size tile you want. The veining pattern on this surface has more fluidity and blends in nicely with any type of décor. It is considered the best neutral tone to install in any home. – This is going to be the least expensive option only because the veining is more obvious here and it’s only offered in one sized tile. Starting off at $1.95 per square foot, this brand of tiling will add a little more character to your space thanks to the rose-colored tint within the veining. If you’re looking for something that’s going to bring a little more color to a space on a tight budget, this is the kind of travertine tile you want. – With this kind of travertine tile, you’ll be able to collide the worlds of modern and rustic, but it will come at a price! Starting at $6.50 per square foot, this style offers a saw-cut veining that appears to flow in one fluid motion. This means that you can install this particular tile in a horizontal or vertical appearance giving off a modern, yet provincial vibe to a space. Whichever kind of natural stone tile you choose to stock for your next building project, you’ll now be more informed with which kind of tile is preferred in certain spaces. Of course, as the builder it’s all up to you. As a retailer, it’s up to the buyer to determine which one of your natural stone products to stock. At any rate, it’ll be up to you to choose which ones are readily available for them and that’s where Nalboor Tiles comes in. Nalboor Tiles sells marble and travertine tiles in bulk at wholesale prices. Contact one of our representatives to order a free sample today. You can reach us online or directly at our Miami, Florida location at 305-501-4548.